Smoke should not be taken lightly for it can cause grave damage to environments and to people. It can lead to a backdraft in structural fires which can harm firefighters. Smoke can carry particles and embers that can be taken by the wind and create additional fires in a community that can cause a conflagration. When it comes to high-rise, buildings fire will create smoke that can be contained inside the building affecting the people inside of it too. Smoke is harmful in many ways, if interpreted correctly the effects can be minimal but on the contrary smoke can also be lethal to the environment and people. Typically, to the ordinary person, when they see a cloud of smoke from the distance their thoughts may be; “I wonder what is burning?”, “The firefighters will be able handle it.”, or “I’m glad it’s not my house.”. What the ordinary person does not know, is that the effects of smoke can be just as dangerous as a fire. When it comes to building fires, if smoke is not interpreted correctly, firefighters can walk into an explosive trap. Smoke can spread out to surrounding environments, causing a conflagration. If we do not take proper action towards the danger of smoke it can affect vital organs that can lead to death. Even though these scenarios are dangerous, we can take cautious procedures to either prevent or reduce the dangers of smoke. A dangerous situation in which firefighters do not want to get caught up in is a backdraft. When there is a fire in a sealed environment, the fire will try to burn all the components in the room. If the oxygen level inside a room drops below fifteen percent, the fire will not have sufficient oxygen to sustain itself. Although the flames may be decreasing, many contents in the room will still be burning above their ignition temperatures and become self-sustaining. Pyrolysis causes the materials in the room to release super-heated gases in the room. These gases are not ignited due to the absence of air; therefore, the room will be fighting for air. The super-heated gases are mixed with the smoke inside the room. As soon as the room receives enough air flow that is when all fuels above their ignition temperature will burn with an explosive force. This backdraft can cause serious injury to firefighters attempting to fight the fire. Fire fighters can avoid these dangers through simple techniques and observations. When firefighters arrive to the scene, they should analyze the smoke and the movements of it. Taking these procedures into play allows them to predict the intensity of the fire, simply by observing the smoke produced. Usually, when the smoke is thick and dark it may indicate that the combustion of the components inside the room are incomplete. Meaning that the items in the room aree still burning. Fire fighters can determine if the room is fighting for oxygen if the smoke is alternately being pushed out of the room and sucked back inside. This happens due to the fire attempting to bring air into the room. Another warning sign is when all the “windows become blackened by smoke stain backed on by the fire” (Klinoff, 2015, pg101). One other prevention technique to avoid a backdraft is by having proper ventilation of an enclosed room. By doing this, firefighters can guide the direction of the smoke and fire, s well as release the pressure in the room that causes it to produce a backdraft. 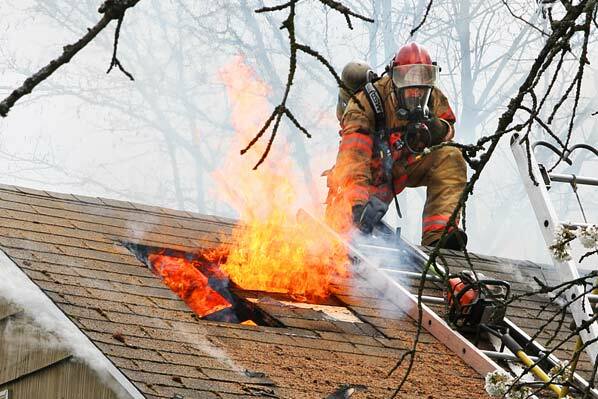 Aside from backdrafts, smoke can cause other fires from falling embers landing on top of roofs. These embers can come from any active fire nearby or from a distance commonly known from wildland fires. The fire does not need to be close to the building, for what causes the embers to fall on the roofs of buildings is the wind. These embers are carried by winds over long distances. Hot embers ultimately come to rest and may ignite surfaces far removed from the fire, resulting in fire spread. This process is commonly known as spotting. If the ember is hot enough then the roof can be brought to an ignition point. Once the roof catches fire, then from that point it will only be a matter of minutes before the building or house is at a complete flash-over. A flash-over is the peak stage of a burning room or building. Keeping in mind that fire is being fought in the wild land, firefighters will not be fully informed about the structural fire. More than likely the structure will spread to nearby structures until firefighters are able to slow it down. The process in which fire spreads in between structured buildings is called a conflagration. All this chaos can occur through the spread of smoke that can go in whatever direction the wind can guide it to. Fortunately, California had passed a law that requires structural roof tops to be fire retardant which means they would be required to be fire resistant. This law was a step in the right direction on preventing the spread of fire. Today there are different ratings for roofing materials Which are divided into three different classifications. Class A Coverings are non-combustible, such as tile, metal, and slate. Class B on the other hand is the application of fire retardant on combustible roofing such as wood. Class C roofs are only given this classification due to its effectiveness “against light fire test exposures.” (UL, 2015, pg1) A safe way, overall, to prevent roof fires is by making the roof fire retardant. This simple use can either prevent fires or slow down the process to a point where firefighters can take proper action. Smoke is a warning sign of what the dangers await from a fire. If interpreted correctly fire fighters can avoid walking into an explosive trap. When it comes to the hot particles and embers inside smoke, it is a good idea to have houses prepared in case those embers land on top of roofs. Nonetheless, having proper safety extinguishments inside a building can reduce the amount of smoke produced to be able to evacuate a building. Overall, smoke should be taken as a warning sign of what is to come to know what actions need to be taken.